A few months after I launched a website for a rural land broker, I received a rather frustrated message about its lack of traffic. Not quite appreciating the joke I made about it being a website for rural land and that I thought a lack of traffic was the point, the dialogue came back around to why he wasn’t getting more leads. I reminded him that he paid me to manage the site’s construction and write it, not generate leads. He didn’t quite know what to make of my response. What my previous client didn’t understand was the concept of inbound marketing. Thankfully for the real estate industry, Pipeline ROI has a pretty firm grasp of it. I know that I often say that a solution that tries to solve everything usually isn’t the solution for anything. I’m willing to admit that in this case, and in keeping with my opening, that dog doesn’t hunt. Pipeline ROI is as comprehensive a real estate marketing platform as I’ve seen in this space. Beyond just covering all the bases, it does it with some real sophisticated marketing measurement tools, a sleek, intriguing user interface and a lead-tracking functionality often reserved for stand-alone CRMs. You can build a website with Pipeline ROI and then market the heck out of it, all from a single login. And then do even more. There are a couple of minor drawbacks, like a lack of advanced social media campaign scheduling and management, or a system for building display ads. To clarify: I think that if a solution is going to tackle so many components of the Internet marketing machine, the absence of this feature stands out a little. Like I said, though: minor drawbacks. Pipeline ROI gives agents a tremendous array of sources from which to capture leads with landings pages, connections to the major portals (as well as more than 100 other real estate sites), e-books, emailed listings and, thankfully, your own listing pages. Pipeline ROI’s “Ghost It” technology automatically creates alternative versions to keep the posts fresh and engaging. It’s really cool. Although it’s not custom programmed from the foundation up, Pipeline ROI’s sites address mobile responsiveness better than most, with self-adjusting menus and visual elements that collapse according to screen size. The sites are ultimately content delivery vehicles, not necessarily customer-focused branding platforms. If you’re comfortable with that, you’ll be more than happy with Pipeline ROI site. 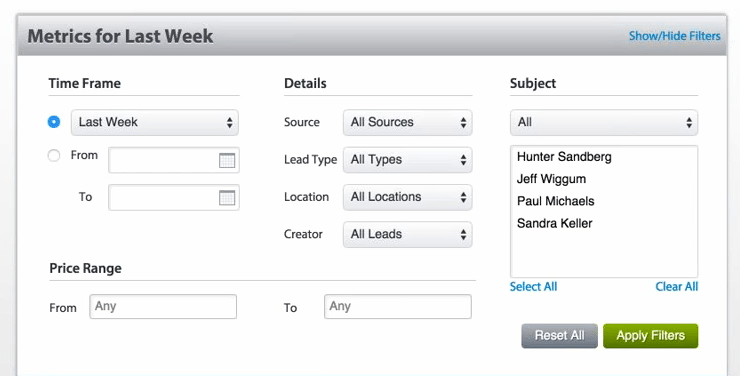 Leads are the name of the game, after all, and they do that very well. Perhaps Pipeline ROI’s most surprising feature is its lead generation analysis tools. Since the solution lets you tightly measure the source of every lead, whether from your e-book landing page or a realtor.com form, it’s easy to determine the value of your marketing dollars spend. For example, if your portal leads are weak for a couple of months, that doesn’t mean you just pull the plug on that ad budget. Maybe your message isn’t hitting the mark, so adjust it, test and remeasure. These are the types of decisions in-depth marketing metrics empower you to make. 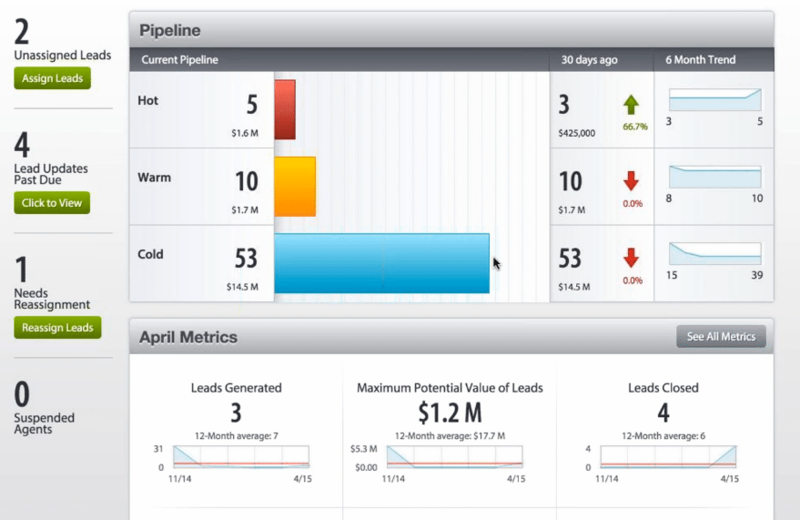 Pipeline ROI neatly sorts your lead generation and activity data into big, bold graphs and readable layouts. The company somehow made the most boring (but most critical) aspect of marketing fun to use. Maybe I’m being a bit too effusive in my praise for Pipeline ROI. 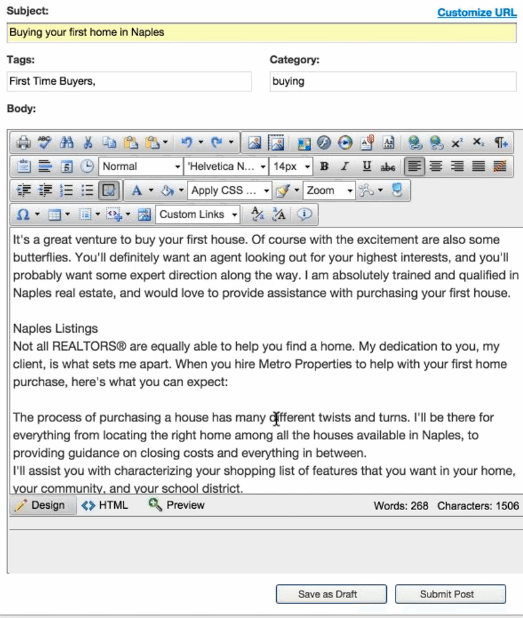 I confess: I’m psyched to see a real estate software company stress the importance of content marketing. I worry that Pipeline ROI is providing a bit too much of the content for you, because I’m an advocate for original copy and content. Most importantly, I’m happy that Pipeline ROI is telling agents that if you want to get good leads, you need give your audience good information. Pipeline ROI is a super sharp marketing platform. Social media marketing. Listing pages. Landing pages. Lead oversight. It’s all in there. I would encourage users to make as much new, fresh content as possible. The Internet needs that. Video record your open houses, talk about a sale that fell apart; whatever you do each day is marketable content. Be authentic to your audience, give them the truth. Then use it to make money with Pipeline ROI. Do you use Pipeline ROI? What do you think? Leave a comment and let us know!